It’s officially here — the cover artwork planned for “RAW 25” on DVD! WWE will release a special “RAW 25th Anniversary” DVD to the United Kingdom on April 2nd, 2018 and the United States on April 3rd, 2018 (Canada and Australia release times to be confirmed), for which we’ve just received finalized cover artwork. It will feature a modified version of the promotional poster used ahead of last Monday’s celebrations, with a few Superstars swapped around and the returning Chris Jericho and Jacqueline added! 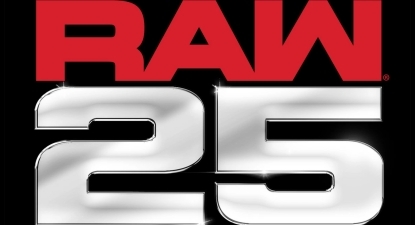 And the “RAW 25 Years” logo now of course reads “RAW 25th Anniversary”. Besides having more than 50 past and present WWE Superstars and Legends on its cover art, this title is set to be produced as a 9-hour, 3-disc DVD collection. The format of its content is still not 100% known due to conflicting synopses, however as of last word indications were that the DVD will present the “RAW 25” episode and a series of extras (matches, moments, memories from 1993-2018 and perhaps now even the pre-show to “RAW 25”); and we’re still expecting this format. Lock in a pre-order for the “RAW 25th Anniversary” DVD by clicking here to Amazon.com ($19.99). UK fans can do the same on Amazon.co.uk. The 2017 WWE PPV DVD collection is now complete! Clash of Champions 2017 has arrived on Home Video in the United States this week after some confusion surrounding its release date. This title and “Best Pay-Per-View Matches 2017”, the first WWE DVDs of the new year, can both now be found listed on Amazon.com. The 2-hour and 43-minute pay-per-view event broadcast last month under the SmackDown brand and was headlined by a WWE Championship main event between AJ Styles and Jinder Mahal, and a controversial tag match refereed by both Shane McMahon and Daniel Bryan! The DVD includes all of the main card matches, an extra presenting the Kickoff Show match, while inside the physical packaging of all first-run copies will be a free Topps trading card of Shinsuke Nakamura. Let’s take a look! Thanks goes out to WDN reader Jordan Deleo for sharing these photos. Respect, titles, even careers – it’s all on the line at WWE Clash of Champions. Kevin Owens and Sami Zayn fight for their jobs in a match against Randy Orton and Shinsuke Nakamura, with both Shane McMahon and Daniel Bryan as special guest referees. AJ Styles defends his WWE Championship against Jinder Mahal. Charlotte Flair takes on Natalya in a Lumberjack Match for the SmackDown Women’s Championship. Rusev & Aiden English, The New Day, and Chad Gable & Shelton Benjamin all try to escape The Uso Penitentiary as SmackDown Tag Team Champions. Plus, more! – United States: RIGHT NOW! Get the CoC 2017 DVD right now here on Amazon.com. – UK/Europe: February 2nd. Pre-order a copy of the CoC 2017 DVD now on Amazon.co.uk. – Australia: March 21st. Your pre-order opportunity is now live over at Madman.com.au. Not feeling the classic photo of Angle in his ‘Team Angle’ gear when that storyline happened on SmackDown. What’s your obsession with being down voted? I just find it hilarious that people will do it for literally no reason. They can do whatever they want. You need to let it go and find yourself a hobby. I wonder if we may have one of the culprits. Hmm. That’s my point; THEY are the ones who need a hobby, lol. No, you’ve been commenting here more than once here about yourself getting down votes. You’re obsessed with it. I’m hoping for the first episode of Raw as a bonus feature since the 4 disc version of the 15th anniversary set, which featured the first raw, is hard to find. Raw back in the day was an hour long and you take commercials away, that’s about 40-45 minutes so I don’t see why they can’t fit it onto this set. I don’t see why those of us who own the first episode of Raw on the 15th Anniversary set should have to be penalised with an hour of our content on the Raw 25 set wasted on it. Attn BAS. I guarantee they won’t add the 1st episode as a bonus. Don’t get your hopes up because you will be dissapointed. Other than the 25th anniversary show the rest of the content will be all matches that are on countless other sets. No I don’t work for WWE but I know I’m right on this one. You couldn’t possibly “know” it Brandon. I do believe your prediction will be proven correct, but that doesn’t mean you “know” it for certain. It’s just a prediction. English 101, my friend. OK if you want to get technical I don’t “know” it for sure but I’m going to be right anyway so let’s not play grammar games. Let’s not be honest and accurate in what we say. Okay. If you agree that my “prediction will be proven correct” I don’t understand why you want to argue. You agreed that I’m probably going to be right so what am I missing here? Because you used the words “guarantee” and “know”, which was wrong, lol. What happens if it does end up being included on there, Brandon? Can you confirm the terms of your guarantee to us and what that covers? Yeah bags of money to everyone if I’m wrong WTF. It won’t matter because I’m going to be right anyway you watch. Lol, you still don’t “know” that you’re going to be right, Brandon. 🙂 Not for sure. Hee hee. It looks like a cool cover! I just hope there are more great matches added from the time of 1998-late 1999. How has Alex ended up with 3 downvotes for simply correcting James M on something James was wrong about? Lol, this site is very entertaining. Given how crappy the show supposedly ended up, they better make up for it with the moments they select. And Thomas has been downvoted 3 times simply for stating how he would like to see the DVD packaged? What is the point in having this voting feature? I missed buying Summerslam 2017 I did have it in my hands one day but I was to busy buying the nhl 2018 tim horton cards but I have all the b ppvs of this year that were out on dvd so far and the rumble plus wrestlemania and survivor series and all I need is clash of champions it said it was suppose to come out in the middle of feb for canada. I am for sure getting that one. Awesome cover! Very excited for the content. Hopefully it contains some extras from after they went off the air. How this general, positive comment from SRB has downvotes is beyond me. Are there three sore losers on here just downvoting everything? Yes. It’s been going on for months. Just trolls. Pretty cool cover for raw 25th anniversary and I completed the ppv collection for last year yesterday when I received clash of champions also.